Arrowsmith, Couloir wasn’t climbed until 1934. There are several options from Lawrence River. and the incident was glossed over – although it was more than 20 years before the route was repeated. From a shingle slope, follow the creek draining the north side of Mt Arrowsmith and climb to the upper basin. From here traverse Pt 2474 metres and reach the crest of the range slightly north of Cameron Col.
Start up the glacier where the moraine wall has been breached, then follow scree and snow to the high Twins–Couloir basin. Climb a steep wall of rock to reach the final ridge and summit. Take one of the two prominent gullies left of the main couloir which lead to a small plateau on the Lawrence divide. From here, follow reasonably angled rock for the last 200 metres to the summit, or follow a snow-filled gully left of the rock. Climb the ridge south of the peak, which leads directly to the summit, starting either on rock or up an ice gully. Follow the Cameron Glacier to the base of the prominent snow couloir cutting the south-east face of the peak. 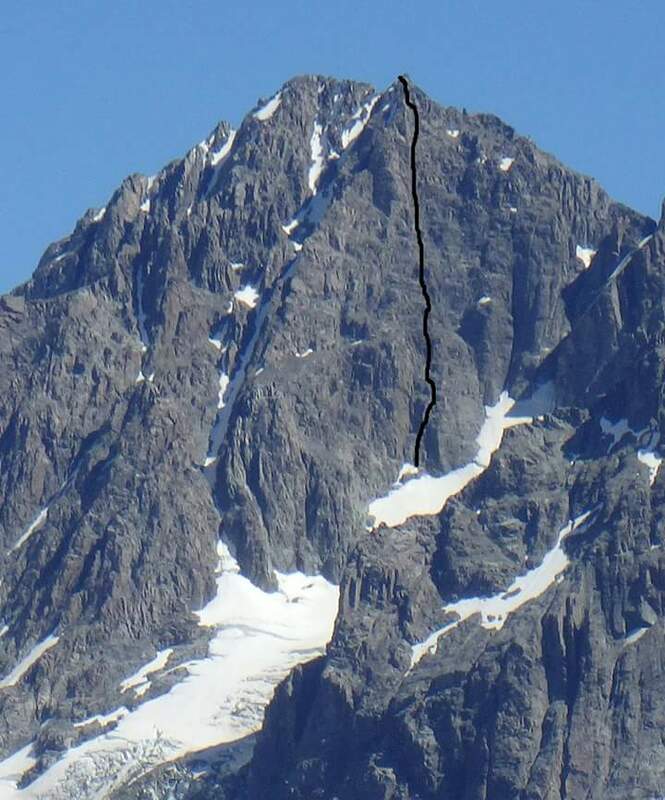 The lower section contains the crux, a steep, two-metre ice wall, after which the route lays back to about 45 degrees and ends about 30 metres from the summit ridge. From here, cross left under the buttress into a short, steep, icy gully then follow good ice for the last 10 metres to the summit ridge. 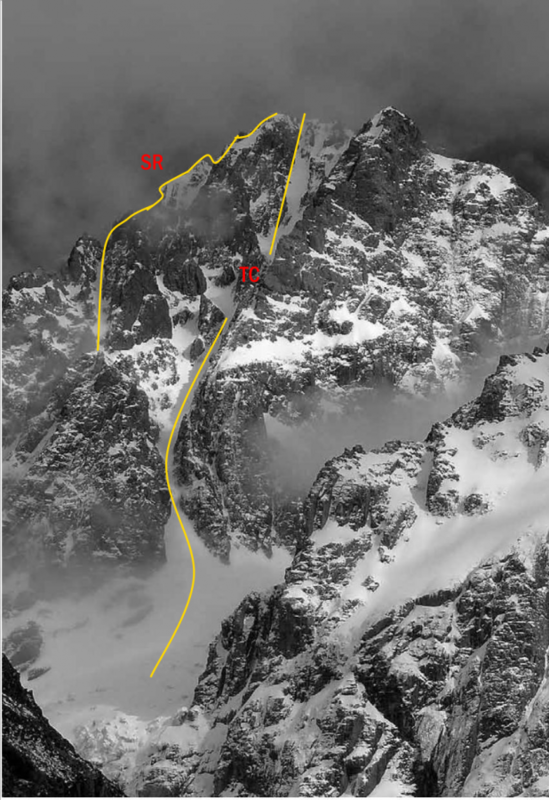 Direct route on East Face of Couloir Peak (2642m) From Cameron Hut, allow 5h for the approach, 7h for the climb, and 7h for the descent back to the hut. Approach – Up Cameron Glacier past icefall to glacier confluence (1700m). Turn left, ascend to 1950m. Then take a right up a steep (50 degree) ice slope to eventually arrive at the base of a prominent corner directly below the summit (2300m). Start 10m right of the main corner. Pitch 1 (40m, 16) – up crack until under roof (20m). Turn the roof by traversing left onto the face (crux). Ascend slabs to belay ledge. Good rock. Pitch 2 (15m, 15) – up corner to belay ledge Pitch 3 (40m, 14) - traverse right out of crack and around arête for 10m. Then up a series of ledges on quality rock Pitch 4 (40m, 12) – follow cracks up to large ledge Pitch 5 (35m, 10) – down right into gravel, then ascend loose easy ledges arriving at a red corner. Pitch 6 (20m, 12) – right and up to top ledge up crumbly, difficult to protect, rock. Scary pitch. Pitch 7 (30m, 15) - traverse left past red corner then up fissure past detached pillar and around corner Pitch 8 (45m, 12) – traverse 10m left then directly up. Follow a series of cracks to wide ledge. Pitch 9 (100m, 10) – Easy scramble up and right. Simul-climb this pitch taking care rope drag doesn’t drop loose rock on partner below. Pitch 10 (100m, 10) – Easy scramble. From the summit ridge it is a further 100m traverse past af gendarme to the summit (2642m). Descent – continue traversing 100m along summit ridge to the SW until at small col above a steep snow/ice couloir on the TL. Descend this steep couloir at first (a rap may be required) for 250m (vertical) to a wide snowfield. Continue along this 600m to the right staying to the west of the ridge on easy ground, crossing point 2474, and eventually arriving at Cameron Col (2427m). Cross the Col and traverse a further 200m due south across the glacier and then carefully turn to descend 700m of steep snow/ice to arrive back at the glacier confluence (1700m).